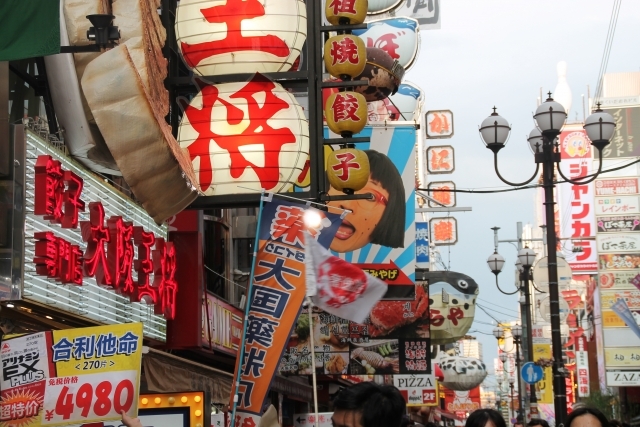 Dotonbori is a place for food paradise where you can find almost every local food specialty. There are thousands of restaurants and food stands along the dotonbori street where you can enjoy a variety of foods at a reasonable price. If you are a food lover, dotonbori is a must place to visit. Here are the list of Top 5 Must-Visit restaurants in dotonbori recommended by locals! Mizuno is one of the oldest Okonomiyaki restaurants in Osaka,which was built in 1945. It was awarded Michelin Bib Gourmand in 2016. They offer Osaka style okonomiyaki, mix every ingredients together in the bowl,and each okonomiyaki is cooked on the hot plate in front of your eyes at the table. The most popular dish is Yamaimo-yaki(1,620 yen). 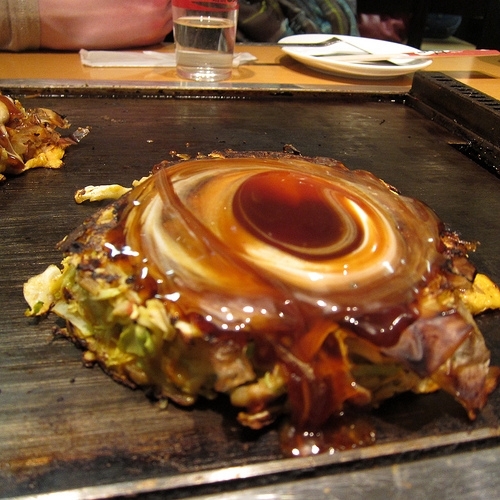 The batter is made from 100％ Yamaimo(yams) not using wheat which makes their okonomiyaki specially fluffy and smooth. You can choose from three ingredients including scallop,Pork Loin or beef loin.You can mix them if you want. The ingredients are very big and they spread them throughout the Yamaimo-yaki. There is always a long line of people during the lunch time in front of the restaurant. So I recommend you to visit during off peak hours(11a.m. or around 3 or 4 p.m. ) to avoid queuing. Location: 3 minutes from Subway Midosuji-line Namba station,2 exit. Daruma is a famous kushikatsu chain restaurants first opened in Shinsekai area of Osaka in 1929. There are around 18 stores so far, and they opened a new store in Manila in 2017. 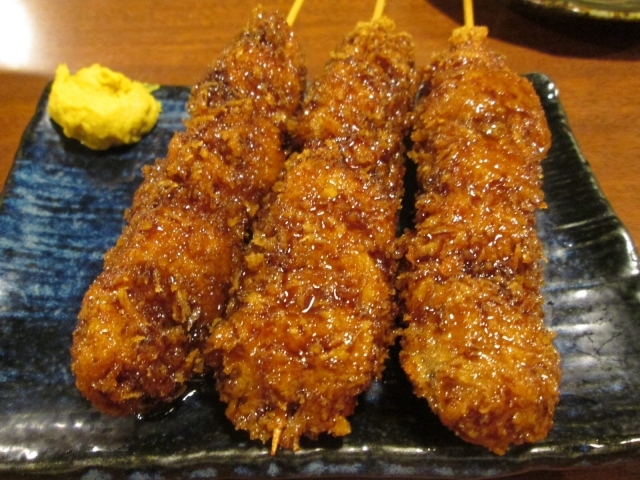 Kushi-katsu is deep-fried meat,vegetables and seafood on the skewers. They offer a variety of kushikatsu dishes including pork,quail egg,shrimp,onion,cheese etc. They cook them in front of your eyes.Freshly fried kushikatsu are so delicious. There are three reasons why their kushikatsu are so exquisite:Layer,oil and sauce. They use only beef tallow to fry kushikatsu which make the outer layer perfectly crunchy. Their Kushikatsu have three flavors, original sauce, coating and good oil which perfectly goes well with freshly fried kushikatsu. Locals enjoy doteyaki as a side dish together with Kushikatsu.Deteyaki is a beef sinew stewed in miso and mirin(Japanese sweet Sake). They are the best match with ice-cold beer or Japanese sake. There is a golden rule to eat Kushikatsu. That is: No double dipping. Other customers will use the same sauce pot,so be considerate to others,and enjoy your delicious meal! If you want to try Kushiage and other finest Osaka’s food, try this Osaka Bar Hopping Food tour with Magical Trip. They’ll get to experience authentic Osaka foods and drinks by pub crawling local izakaya bars that travelers normally couldn’t find. Konidoraku honten Osaka is one of the symbol of Osaka. You might see the giant mechanical crab outside the restaurant in TV or magazine before. They offers a wide variety of crab dishes including shabu shabu,sashimi and kani nabe(Crab hotpot). There are also unique menu such as crab croquettes,crab’s chawanmushi (a traditional Japanese steamed egg custard). The crabs are very sweet and juicy, it taste great on its own taste without any kind of dip or sauce. You can not only have a great crab dish, but also enjoy a nice view of dotonbori street and river. 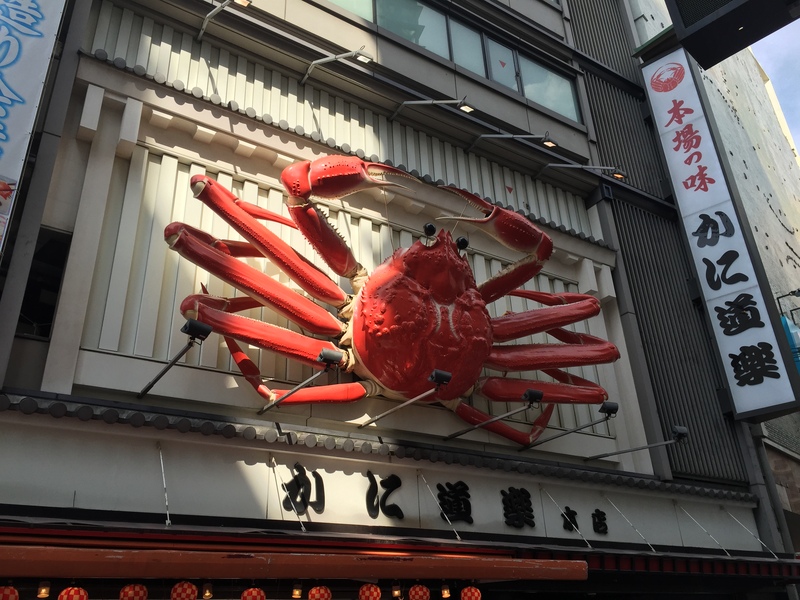 If you are a crab lover & want to feel real Osaka, Kanidouraku Dotonbori is a must place to visit. 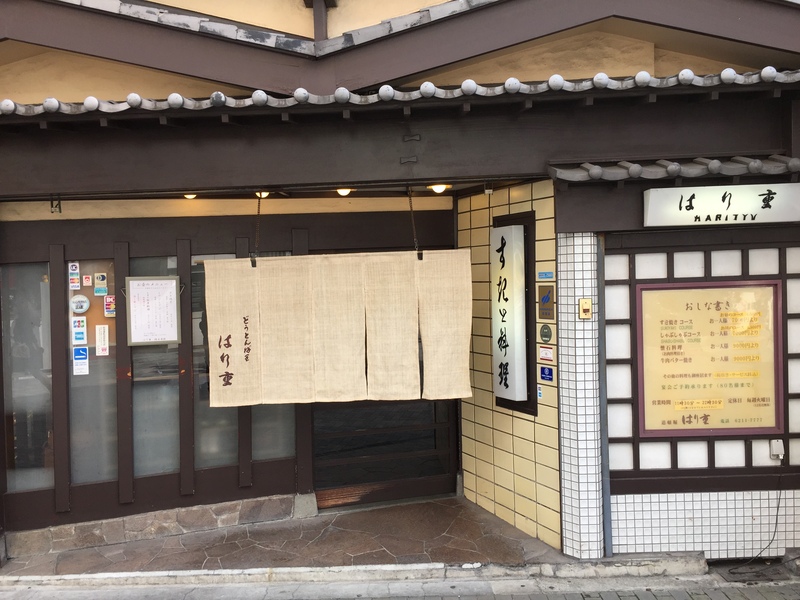 Harijyu has been enstablished more than 80 years,and one of the most famous shabu shabu& Sukiyaki restaurants in Osaka. They serve Shabu Shabu and deluxe sukiyaki in the Japanese style room upstairs and Western style beef steak downstairs. Both sukiyaki course and shabu shabu course have 5 different grade ranging from the lowest grade to the highest grade between 7,000 yen and 17,000 yen. Don’t worry about having the lowest grade beef,it is less marbling,but tastes as good as the highest one. The beef are melt in your mouth tender.Their homemade Sukiyaki sauce goes well them very well. The service is great, the staff will show you how to cook shabu shabu in the hot pot. If you are a meat lover and want to experience authentic Japanese cuisine,you should definitely visit Harijyu! Be sure to make reservations in advance. Closed: Tuesdays ※Except when Tuesday is public holiday or The day before public holiday or in December. 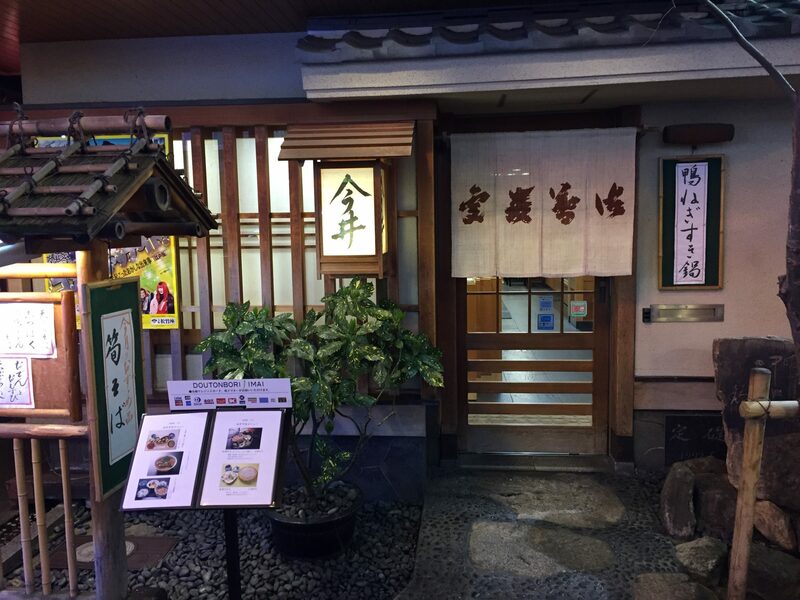 Dotonbori imai honten is known as one of the best Udon restaurants by locals in Osaka. It was established in 1946.It is located in the middle of Namba ,3 minutes walk from the famous Glico running man. The popular dish here is the udon dish called “Kitsune Udon”. Kitsune Udon is a hot wheat noodles topped with sweetened fried tofu. This sweetened fried tofu is very fluffy and juicy,Udon are nice and chewy and the soup is so tasty. You can enjoy nice udon in a traditional atmosphere at a reasonable price. There are a lot of udon restaurants in Osaka, but Dotombori Imai Honten is absolutely the best udon restaurant in Osaka. I hope you’ll find the best dishes in Dotonbori,Osaka! Find the best things to do in Osaka. Get travel tips and book tours, activities, restaurants and attraction tickets in Osaka. Enrich your travel with Voyagin. There are also a variety of unique food tours in Osaka. If you want to try Izakaya and other finest Osaka’s food, try Osaka Bar Hopping Food tour with Magical Trip. Local tellsTop 10 Must-Eat Foods ranking in Osaka!Enjoy Local Specialties!